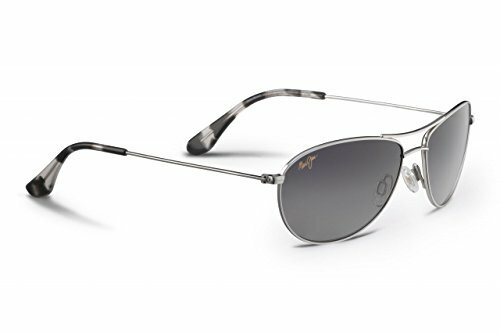 Maui Jim Sunglasses, style Baby Beach is an Rx-able aviator-inspired titanium frame which is lightweight and durable. The Baby Beach features non-slip silicone nose pads and plastic temple tips to ensure total comfort. The Baby Beach is designed to be worn in salt water with its corrosion-proof hinges. Featured on the right lens is the Maui Jim logo. Maui Jim Sunglasses have scratch/impact resistant lightweight polarized lenses that provide superb optical clarity.